Heidelberg, which played such a crucial role in the career of Jan Gruter, the subject of my previous post, provides a setting once again as one of the cities central in the life and (mis)fortunes of Elizabeth Stuart (1596–1662). Elizabeth was the eldest daughter of James VI of Scotland and I of England and his queen consort Anna [Anne] of Denmark, and at this time of writing an exemplary critical edition of her correspondence is well on its way to completion. Based on the prize-winning PhD thesis of the Leiden scholar Dr Nadine Akkerman, the edition is published by Oxford University Press: the second volume, containing letters from the years 1632 to 1642, appeared in 2011; and the first volume, with letters from 1603 to 1631, was published in 2015. Once the third and concluding volume rolls off the press, nearly 2,000 letters to and from Elizabeth will be have been assembled from some fifty different archives and collections worldwide, and Dr Akkerman will follow her stellar edition with a biography of the Stuart princess. Elizabeth married the Elector Palatine Frederick V on 14 February 1613 and travelled to Heidelberg in June of that year at the age of sixteen. She lived in the city for six years before moving to Prague in October 1619, following Frederick’s ultimately disastrous acceptance of the crown of Bohemia. 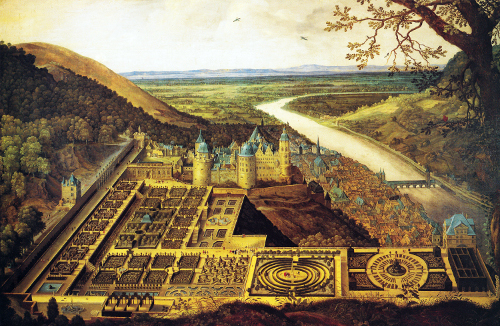 During this time Elizabeth and Frederick created the Hortus Palatinus, employing the French Huguenot Salomon de Caus (1575–1626), the engineer and tutor of mathematics who had worked previously for Elizabeth’s brother Henry at Richmond Palace, at Denmark [Somerset] House for her mother Anna, and for her father’s secretary of state Robert Cecil at Hatfield. De Caus’s designs for the garden were published in 1620 as Hortvs Palatinvs: A Friderico Rege Boemiae Electore Palatino Heidelbergae Exstructus, a copy of which has been digitized by the Universitätsbibliothek Heidelberg. Of course this work on Elizabeth’s garden came to an abrupt halt with the outbreak of the Thirty Years’ War, whereafter the site became a military base. Elizabeth is known to have maintained an epistolary archive, filing both her incoming correspondence and copies of outgoing letters (an inventory was made in the 1630s by one of her secretaries, Sir Francis Nethersole). Tragically, her servant William Curtius reported that her cabinets, containing ‘rarities, books, and papers’, sustained significant water damage during Elizabeth’s final crossing from The Hague back to London in 1661. Elizabeth is known also to have destroyed much sensitive material. Indeed, she wrote to Sir Thomas Roe on 25 June 1631 that all his letters ‘are sure for the fire hath them’. EMLO is delighted to be publishing the first installment of metadata from the surviving and recorded correspondence contained in the two volumes of the edition published thus far, which cover Elizabeth’s life from her birth in Scotland, through her childhood in England, her years in Heidelberg, and her brief spell in Prague, to the first half of her exile in The Hague. Users working within a subscribing library will find that each letter record in EMLO links to Oxford Scholarly Editions Online where the relevant annotated transcription may be consulted. Publication of this catalogue coincided with a public lecture and workshop on Elizabeth held last week at the University of St Andrews. Conceived by the University’s inspiring rector Catherine Stihler, who has nurtured a long-standing interest in Elizabeth, and shaped and hosted by Professor Steve Murdoch, the event drew together scholars to consider the character and achievements of Elizabeth as well as the momentous events and related circumstances that made up the very fabric of her life. 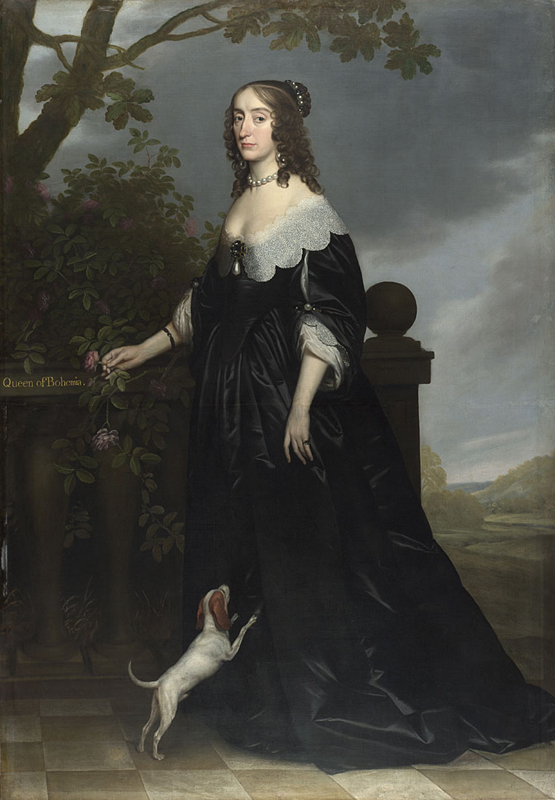 In an impressive public lecture, Dr Akkerman debunked the persistent misrepresentation of Elizabeth as a pleasure-seeking airhead who doted more attention on her menagerie of pet monkeys and parrots than members of her own family, quoting a letter from Elizabeth to her brother Charles I in which it is abundantly clear that the ‘munkeyes’ referenced therein are none other than Elizabeth’s beloved brood of children: ‘Your honest fat henry Vane can tell you, how Hunthorst hath begunne our pictures, Where you will see a Whole table of munkeyes besides my proper self …‘. 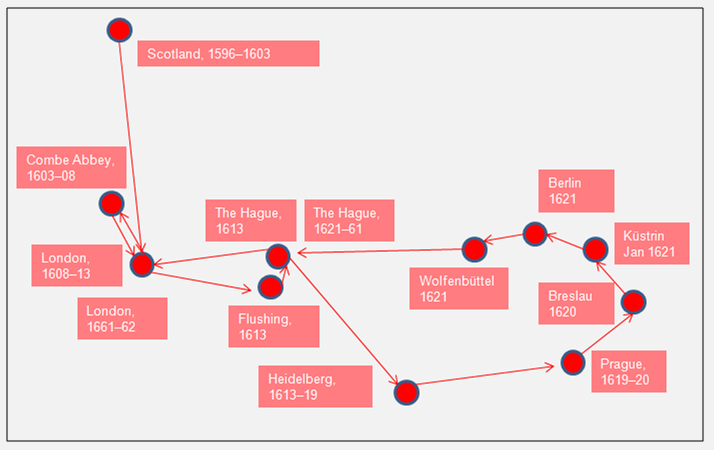 Elizabeth’s movements around Europe, 1596–1662. Following Frederick’s death from fever on 29 November 1632 just weeks after the death at the Battle of Lützen of the Protestant leader Gustavus Adolphus, Elizabeth was left as the driving force behind the movement to restore her family to their lands. Exiled from both the Palatinate and Bohemia, she presided over a court based in The Hague for a full four decades and it is from here that the majority of her correspondence is conducted, much of it in cipher. During these years, with the momentous events of the Thirty Years’ War working out their dreadful course, and with civil war erupting in the British Isles in the 1640s and the ensuing rule of the protectorate from 1649, the threads of who was doing what, when, and where begin to get tortuously tangled. Spies abound; many of them turn out to be women. People assume aliases and are not who they profess to be. Teams of highly trained individuals assemble in Black Chambers to foil plans and unmask agents. In the tradition of many of these female spies, I shall not give anything away, but do keep an eye on Dr Akkerman’s ongoing research into the women who slipped back and forth across the seas between the United Provinces and England in the decade prior to Elizabeth’s return to London in 1661. All I will say at this point is that Nadine Akkerman and Elizabeth Stuart have a clutch of remarkable stories tucked up their collective sleeve! This entry was posted in Uncategorized on April 30, 2017 by Miranda Lewis. In recent weeks Cultures of Knowledge has played host to a number of COST-funded ‘short-term-scientific-mission’ visitors, one of whom has been considering how best the project’s current prosopographic data-model might be expanded to include a number of less-easily quantifiable categories, many — but not all — of which pertain to the lives of women. One area under scrutiny is that of education. In a male-centric model, fields tend to be event led: for example, who attended a certain school between which years under a known headmaster; who matriculated to which university on a particular date; and who was awarded which degree when. But less quantifiable information should be captured in addition: which languages could an individual read, and which speak; whether the parent of a child was involved directly in his or her education; whether the individual in question was the owner of a library and, if so, which books did it contain, and to whom were these bequeathed. The answers to these questions can be highly revealing and they are of especial relevance to the subject of EMLO’s most recently published catalogue, Jan Gruter. The poet, philologist, and librarian Gruter [Janus Gruterus] was a first-class linguist, studying at Cambridge and at Leiden, and teaching at Rostock, Wittenberg, and Heidelberg, before taking up the position of librarian of the Bibliotheca Palatina in 1602 following the death of Paul Melissus. In addition to becoming caretaker of one of early modern Europe’s most remarkable treasures, Gruter assembled a significant personal library of his own. Both libraries suffered immeasurably following the capture of Heidelberg by Tilly’s imperial troops in September 1622 and a significant portion (the Latin and Greek manuscripts) of the Bibliotheca Palatina was taken to Rome as ‘spoils of war’ and was presented there to Pope Gregory XV. The German manuscripts were left behind, however, and may be consulted in Heidelberg today. Gruter, the man of many languages, fled south to Tübingen and Bretten. Much of the finer detail regarding Gruter’s life is known from the panegyric published in 1631 by one of his pupils, Balthasar Venator. Perhaps the most remarkable fact passed down by Venator is the information about Gruter’s mother, Catherine [Catharina] Tishem [Thysmans]. Catherine was an English woman, from Norwich. She was highly educated, fluent in Latin and Greek (and with a tendency to read Galen in the original), in addition to French, Italian, and English. She taught her son his languages. This will not be news to scholars within the WEMLO network, nor is it unusual for a mother to take charge of the early education of a young family. It is, however, a category of information that needs to be considered and recorded wherever possible for early modern individuals: which languages could a person read, and which write. Might it emerge that a significant number of women were better educated than has been assumed previously? Who stands in the shade behind every great man? Well, behind Jan Gruter, it was Catherine Tishem, a woman whose exceptional skills were recognized, I am pleased to note, by George Ballard in his 1752 publication Memoirs of several ladies of Great Britain, who have been celebrated for their writings, or skill in the learned languages, arts and sciences. This entry was posted in Uncategorized on April 19, 2017 by Miranda Lewis.